These are super fine. They are perfect for holding two pieces of quilting cotton together when piecing a quilt, but they do not work well for anything heavy. Don't try using these on a denim quilt, but next time you're sewing hexagons together for a quilt, these are great. Because they are so fine, there is minimal distortion in the pinned fabric. I find my piecing is more accurate when I use them. Just a couple warnings on these: They hurt when you get poked. They will draw blood. Don't sew over them because your needle can bend or even break them. Sew carefully! I'll be throwing in a package of these on Friday! These great clips have been making the rounds on blogs lately. I joined the wonder clip club about eight months ago when I bought a box of 50, and I love them. I use them in place of pins a lot, particularly with heavy projects that are hard to pin. The only con I've found with these is that they tend to slip just a bit on extra-thick projects like my messenger bag. 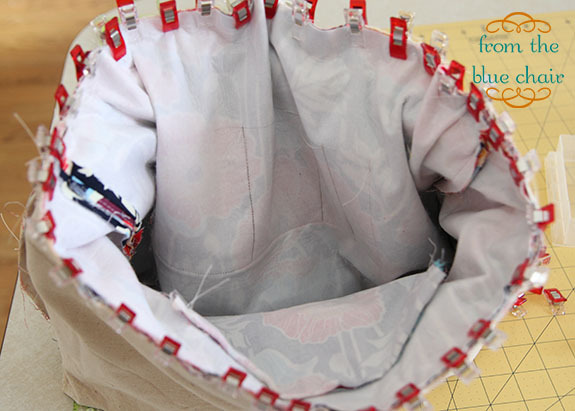 Watch out for that while sewing projects like this. They work great for binding. They are also perfect for keeping seams together when pins could be painful (literally). I'm throwing in a 10 pack Friday! I love my quilting gloves. I realized I own four different pairs. They all look pretty worn. I always wear gloves while quilting my quilts. My hands are naturally quite dry and slip while I'm quilting unless I wear gloves. My two favorite pairs are the purple and pink ones. The navy pair is from Fons and Porter. The white pair is actually a pair of fruit picking gloves. The packaging was in Japanese I believe so I don't have any more info that that. The pink pair happens to be leather gardening gloves from Target. They are perfect for large quilts and give me really good traction while trying to wrestle with quilts as large as a queen. They are big and bulky and don't work well for smaller quilts. One of the reasons I have so many pairs of gloves for quilting is that some seem to work better than others for certain quilt sizes and even certain fabrics. 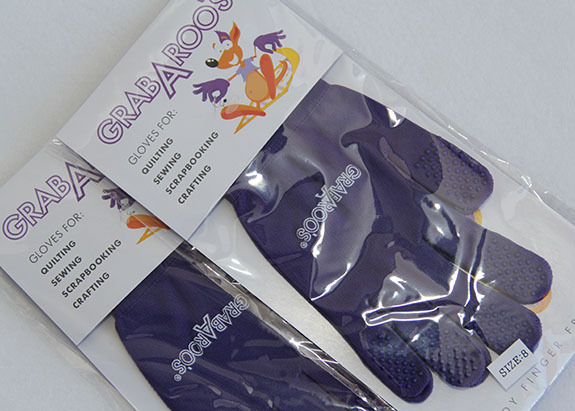 The purple gloves are from Grab-A-Roos. These are perfect for smaller quilts. They fit snugly to my hands and don't add extra bulk. The grippers on the fingers give just the right amount of traction. As you can tell, my pair has been used many times. The kind people at Grab-A-Roos threw in a couple pairs for Friday! Also, Christa Quilts carries Machingers Quilting Gloves in her notions section if you'd like to give that brand a try. It's looking like Friday will be epic. I've really enjoyed seeing all of these fun favorites. Three things I don't use enough in my quilting. I've been seeing the binding clips everywhere and I'm seriously considering switching. And I know that gloves would make my quilting experience less frustrating. Thanks for sharing these. I only use "Flower Heads" as well. I've not seen the Wonder Clips as of yet - (must be I don't get out enough, LOL) But I do believe this will on my list when I am out and about. They look like they'd have more use than just holding binding which is great since I do several different sewing projects. The Wonder Clips are on my list of things to try. Considering that I stick myself with pins far too often, they'd be an excellent alternative. Your post are certainly making me want to go buy tools etc. I don't have any great pins and I've been contemplating the clover clips for awhile now. Would be so cool to win some. I'm looking forward to Friday! You have shown us lots of great stuff so far! I'll have to give those pins a try! I love thin pins but I am not too fond of how they glide into my fingers. Of course, the kids think ot is funny when I go to grab a pin and it is sticking straight out of my finger! "Mommy pin cushion funny!" Well, at least they are entertained! Thanks for the tip on the pins and clips. I just bought some of the wonder clips to try out. If I like them, I'll start carrying them in my store. I bought some Wonder clips last Fall and love them! I use them to hold together my 60 degree diamonds (made with Quilt patis, another great "tool") when I'm hand sewing. Do you have any suggestions for needles? I have some needles I got from my grandmother (they are really old) and another packet of thin needles with slightly larger holes. I have become obsessed with my diamond star/hexagons but my needles keep getting bent. Maybe a needle review is on for tomorrow?!!! I love my Wonder Clips, especially for binding quilts, and using laminates. They do make a jumbo size now - they're green with a bigger jaw and longer bodies ( and measurements in the back!) I'm saving up to add some to my collection. I love the wonder clips, but did you know they have jumbo ones? I found some on amazon the other day when looking for the wee ones, and was seriously tempted! I've been wondering about those clips! thanks for the review, i didn't know if they were a gimmick or just really wonderful! Great favorites. I have a few of those on my list of favs too. I wonder if the new, larger clips would hold tighter and not slip? I need to get more of the red clips because the pack of 10 I got just aren't enough. I would never have thought to try gardening gloves - how clever! 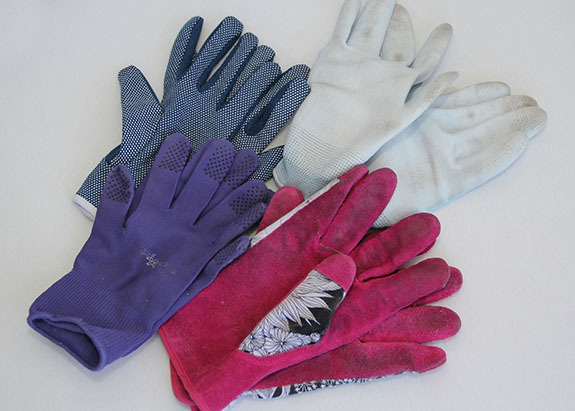 I have two pair of gloves and my go-to pair are Machingers. They're lightweight, close-fitting and grip like crazy.